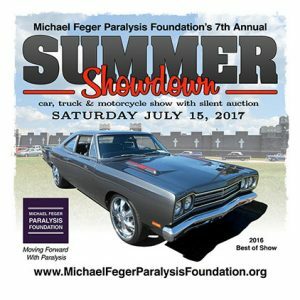 The Michael Feger Paralysis Foundation is hosting the 7th Annual Summer Showdown Car, Truck & Motorcycle Show / Silent Auction on July 15, 2017. Vehicle Registration is $20 from 10am to 1pm. Pre-registration before July 8 is $15! Open to all Cars, Trucks & Motorcycles. First 100 vehicles will receive a Dash Plaque and Goodie Bag. Over $400 in Door Prizes will be given away!